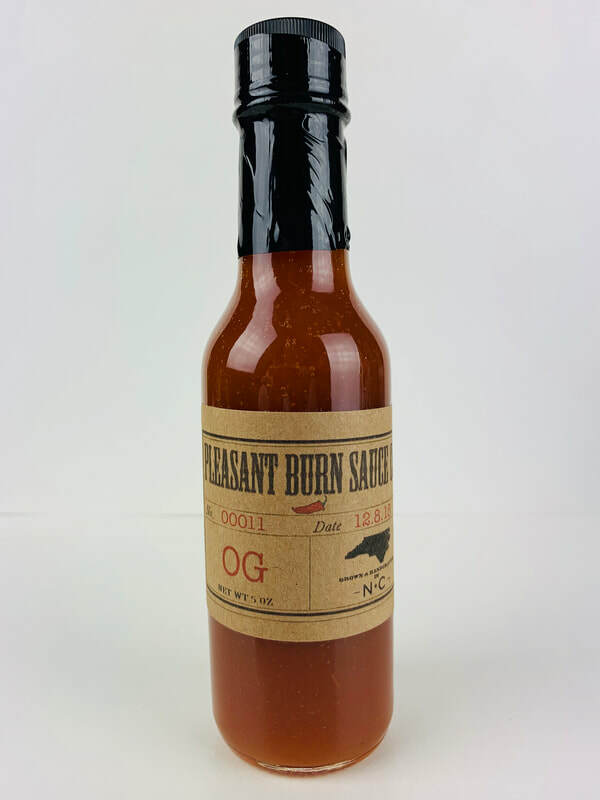 Pleasant Burn Sauce Company was founded in 2012 by Corey Eshelman. Mark Waters joined the company in 2015. We are a small start up company based in Durham, NC. The idea of making sauce was born out of the need for better flavors for our annual oyster roasts. We wanted to make savory sauces that could be enjoyed by everyone. So began the search for the perfect blend! Many types of sauces were conjured and produced, and a few that were deemed worthy were reproduced and refined. Soon, people were asking where to find the sauce for purchase! The OG and Citrus Reaper became our first production sauces and so it all began. All of the peppers and most ingredients for our sauces are sourced from our personal gardens. We pride ourselves on producing our sauces from start to finish by hand. We strive to use only the most fresh and highest quality ingredients. Making the sauce in small batches insures consistency and quality. The OG is a vinegar based hot sauce made from a blend of Carolina Reaper, Habanero, and Tabasco peppers. The heat is medium and it is a great sauce for any reason! Perfect for flavoring dishes, wings, barbecue, or as a topper. A very versatile sauce that anyone will enjoy! The CR is a combo sweet and hot sauce with a nice reaper kick. The heat comes from a pepper blend is Habanero and Carolina Reaper. The sweet comes from fresh squeezed citrus juice with a touch of honey. This sauce is great as a topper for almost anything and the citrus makes it perfect for seafood! OG from PLEASANT BURN SAUCE CO... As soon as I tasted this sauce I got a rush of nice heat, an up front vinegar flavor, a pepper blend of Carolina Reaper and a touch of brown sugar. If you follow my reviews you know I love the simple ingredient sauces and this one is just that. Just these ingredients makes a very tasty sauce that will add a tremendous amount of flavor and heat without taking over your food. Add this sauce to BBQ, fish and chips, pizza, tacos, eggs or any dish that a dash of vinegar would taste great on. 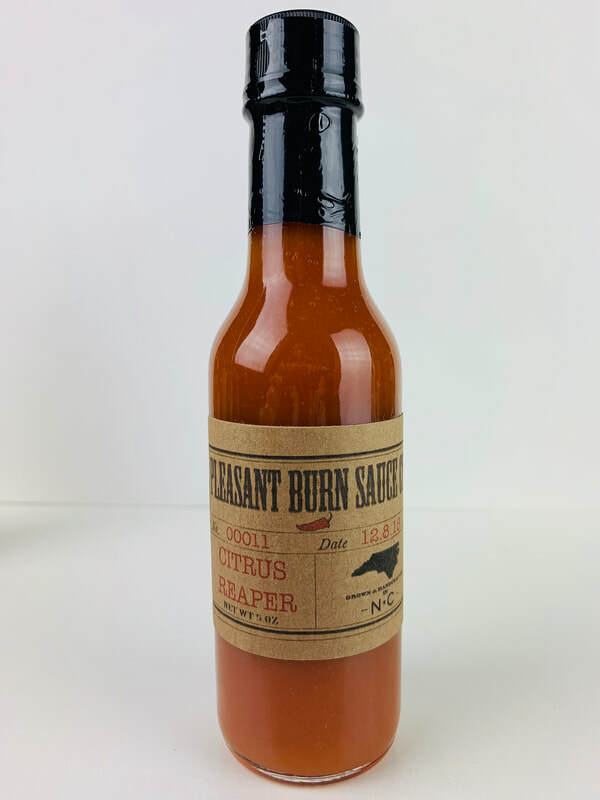 I even like putting it on potato chips to make my own salt and vinegar chips with a great kick of heat..
CITRUS REAPER from PLEASANT BURN SAUCE CO... Citrus Reaper Is a lot like OG with the addition of a sweet citrus flavor at the start with garlic, honey, and fresh squeezed citrus juice. It has a slight more sweetness with a little more heat. Another great sauce I'm really enjoying. A great job well done to Mark Waters for make two amazing sauces. Once again this sauce will go great on BBQ, pizza, fish and chips, tacos, eggs or any dish that a dash of vinegar would taste great on. This would also make a wonderful salad dressing if you mix it with some olive oil and red vinegar.